Somerset House is one of the most interesting buildings in London, the present building dates from 1775 but was not completed until the early 19th century. This building replaced the old Tudor Palace on the site which had been built by Edward Seymour, Lord Protector and Duke of Somerset. 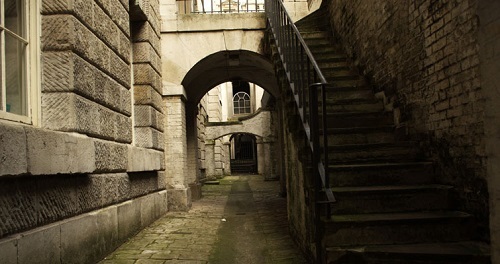 This particular area alongside the river side and Strand frontage were popular locations for the London residences of the aristocracy and many fine houses were built here. 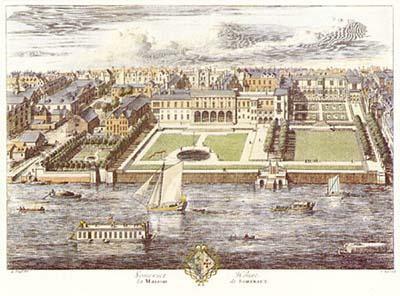 By 1551 Somerset House was virtually complete, but the Duke had little opportunity to enjoy luxurious surroundings of Somerset House. He was accused of treason and executed on Tower Hill in 1552. After Somerset’s execution the building passed into the hands of the Crown. The house was occupied by Princess Elizabeth, the future Queen Elizabeth I, until her accession to the throne in 1558. Following the death of Elizabeth in 1603, James I of England and VI of Scotland married Anne of Denmark and Norway, Anne was given Somerset House for her own use and renamed the place ‘Denmark House’. Charles the First’s wife, Henrietta Maria of France then began to use Denmark House with reconstruction overseen by Inigo Jones. However she fled to France during the Civil War, just before her husband’s execution. During the Civil War Denmark House was used as quarters for General Fairfax who commanded the Parliamentary Army. When Cromwell died in 1658, his body lay in state at Somerset House. After Charles II’s restoration in 1660, Henrietta Maria, Charles I’s widow and now Queen Dowager, returned to Denmark House. The house managed to survive the plague and the great fire of London 1666 but was not able to survive the ravages of time and in the 18th century was virtually a ruin. The grand new building of 1775 was created to bring together various government departments and learned in one building. One of the first occupants were the Royal Academy of Arts who were joined by The Royal Society and the Society of Antiquaries . Government offices included the Navy Board, the Sick and Hurt Office, Victualling Office. 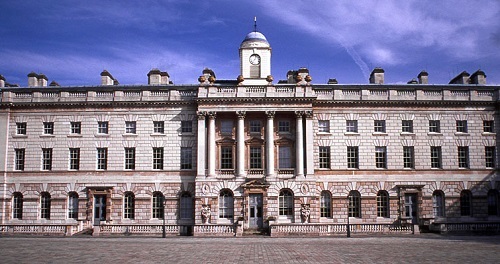 General Register Office , Principal Probate Registry and The Board of Inland Revenue who occupied the east and west wings of Somerset House until 2011. In the last 20 years, there has been a comprehensive restoration programme which has seen galleries and other cultural spaces introduced. The Embankment Terrace has been reopened and the great Courtyard has been transformed to produce one of the most vibrant public spaces in the capital. 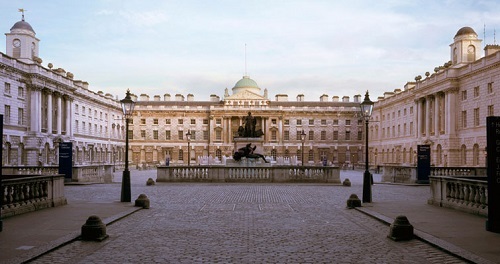 It is the location for a variety of concerts and other outdoor performances in the summer and the scene of the popular Somerset House Ice Rink during the winter period. The North Wing is occupied by the popular Courtauld gallery and the whole site has a large range of events throughout the year. By londonvisitors2014 in London Attractions on January 7, 2016 .